Leaders in business looking to improve their organisation’s performance can do so by improving their emotional intelligence: that is, their skill at identifying, understanding and influencing emotion. There is a direct link between the way people feel and the way they perform at work. This is one of the most robust and consistent findings in organisational research. In high performing organisations people feel significantly more engaged, cared for, valued, proud, and motivated than those in low performing organisations. Conversely, in low performing organisations people feel significantly more fearful, stressed, disempowered and uncertain. Leadership is fundamentally about facilitating performance. Research has proven that a leader’s emotional intelligence is key to their capacity to facilitate emotions in others that drive high performance and employee engagement. This is more than just a moral compass; it’s also a recipe for success. 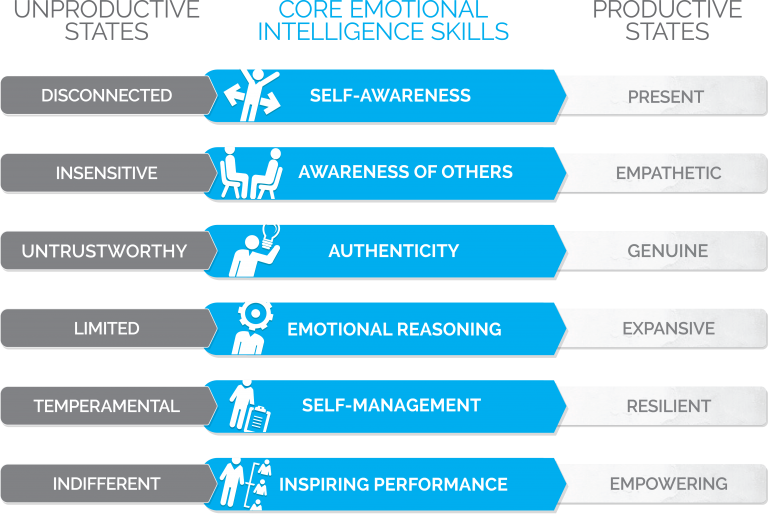 Organisations with emotionally intelligent leaders achieve a critical lever of sustainable competitive advantage: a high performance culture and customer loyalty. Emotionally intelligent leadership competencies reflect what leaders do with their emotional intelligence in the leadership of people. The Genos model of emotionally intelligent leadership competencies is shown below. People often learn and develop more with this type of leadership style resulting in continuous enhancements to performance year-on-year. The Genos emotionally intelligent leadership survey is the best measure of emotional intelligence for leaders. It measures how well you demonstrate emotionally intelligent leadership competencies in comparison to others. The more often you demonstrate the competencies measured, the more effective your leadership should be. This assessment is designed for emerging or front-line leaders. Perfect for use in development workshops, conferences and other group development mediums. This assessment is designed for front-line to supervisor development. This assessment is designed for middle to senior leadership development. Customisable rater categories are used to suit the vernacular your people are familiar with. Interpretation of results is engaging and readily accessible with our beautifully presented reports. Benchmarked, raw and gap scores for each competency and behaviour, measured to help leaders quickly interpret and act on their results. Raters provide free text responses for each competency assessed. These are captured in the Feedback Report and help leaders understand the context behind rater responses to assessment questions. The ‘traffic light’ methodology helps leaders quickly identify gaps between how important and how well they demonstrate emotionally intelligent workplace behaviours. Housed in a modern, responsive, online survey system. Raters can complete on their phone, tablet, PC or Mac, anywhere, at any time. The simple and secure administration platform makes it easy to set up survey groups, monitor survey progress and download finished reports. For information about how to order Genos EI Assessments visit Genos Service Options. How to use the Genos EI Assessments? A Genos EI Certified Practitioner is required to run a Genos EI Assessment and to debrief the results of the reports with participants. Genos provides an EI Certification Program to allow learning and organisational development professionals, human resource consultants or managers, executive coaches, and organisational psychologists to administer Genos EI Assessments within their own or for client organisations.